Domestic Gutter systems come in a wide range of materials, shapes and colours, from standard Black Half Round to Caramel coloured Ogee patterns. But not many people realise that there also a number of choices available when it comes to gutters for commercial buildings, with different colour, material and design options. The term “Industrial” generally denotes size when it comes to gutter classifications. Most Manufacturers include a large profile gutter system that has a higher capacity for use on larger or steeper pitched roofs which is usually between 150mm and 170mm across the top. However many customers are unaware that on smaller industrial installations our Ogee or Deepflow gutter systems are perfectly adequate, as is our 135mm Steel Option. If are unsure about which system works best for you, be sure to read our guide on Choosing a Large Gutter. On larger commercial buildings, the Floplast 170mm XtraFlo system is an excellent choice. With a Deep Flow style design it comes in three colour options – Black, Grey and White, and uses regular style fittings – installing this system is no different to installing domestic gutters. Xtraflo has an extremely high flow rate – up to 11.8 litres per second when laid to a fall with an outlet and the end of the gutter run. 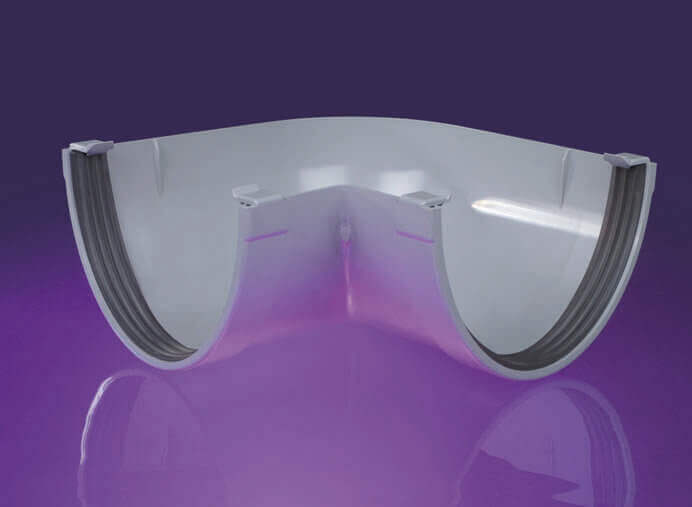 Our 135mm Galeco Steel gutter can be used for industrial applications due to its size – it actually measures 152mm across the top of the gutter due to the clever design of the “internal roll “feature, which greatly increases capacity. This system is available in Black, White, Copper Effect, Graphite Grey and Galvanised finishes. The 135mm Steel system uses an 87mm downpipe system. The 150mm Galeco Steel Gutter is a real monster – measuring 173mm across the top. This system discharges into a 100mm downpipe, enabling it cope with huge torrents of water. The 150mm Steel system comes in a Galvanised finish. Prior to the 1970’s, Cast Iron was the only option for commercial buildings needing a standalone gutter system. Still popular on heritage style buildings, Cast Iron is very long lasting and very environmentally friendly. Installation takes a little longer due to the weight of the product, but the finished effect is truly eye-catching and a must for traditionalists. 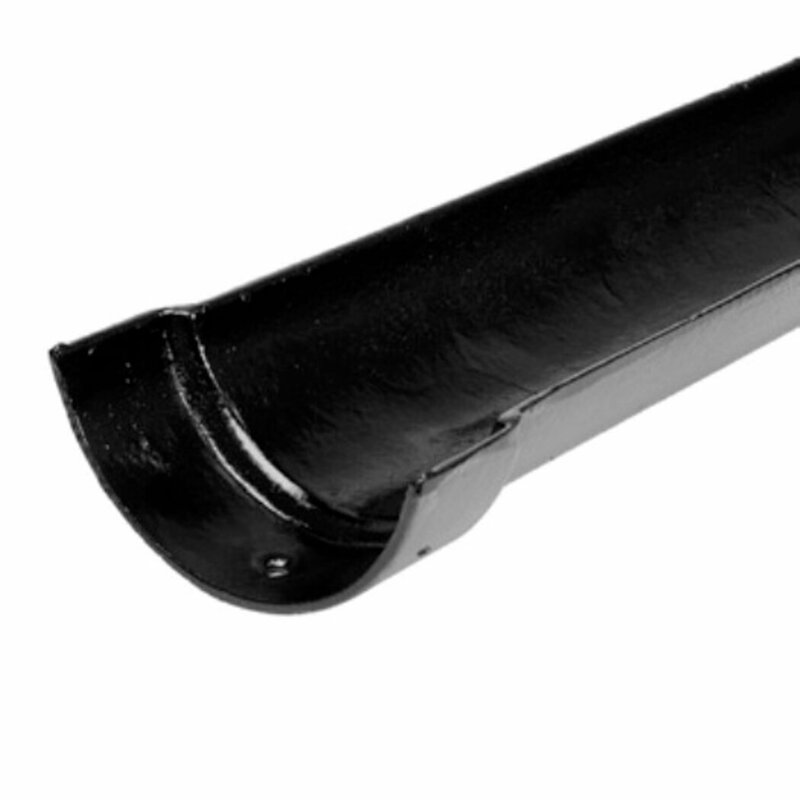 The Cast Iron Industrial gutter system is 150mm across with a 75mm eared downpipe. Cast Iron is the most expensive of the three options here and it comes in a factory-finished black colour. Most Industrial Gutters use a larger than standard downpipe of between 75mm and 110mm depending upon the material. This is partly for aesthetic reasons - it is important to note here that the capacity of a gutter system is very rarely limited by the downpipe, as all system matched downpipes can carry much more water than the gutters to which they are connected.